If you don't have access to an outdoor grill, or maybe it's just too cold to go outside, you can still cook a fantastic steak without leaving your kitchen. We tested four different techniques. Each one worked well, and there's sure to be a best method for every steak preference. You could use any cut of steak for these methods, but for our comparison, we used tender steaks, like NY strip or ribeye, cut between 1 and 1 1/2 inches thick. Each was brought to room temperature before cooking, which means taking it out of the refrigerator and letting it sit on the counter for 30 to 60 minutes before cooking it. A room temperature steak will turn out better because it requires less time over the heat, which in turn helps ensure it doesn't overcook. And speaking of cooking, the best way to cook a steak indoors is on a cast-iron skillet. Cast iron gets hot and stays hot, and because it's flat, you can be sure that every inch of your steak comes in contact with its hot cooking surface. Also, to cook a great steak, you need to season it adequately. This means plenty of Kosher salt and freshly ground black pepper. Next, we assume that you like your steaks medium-rare to medium, because that is what the techniques below will give you. If you like them less or more done, you'll need to modify the methods here accordingly. Finally, you'll need to rest your steaks. 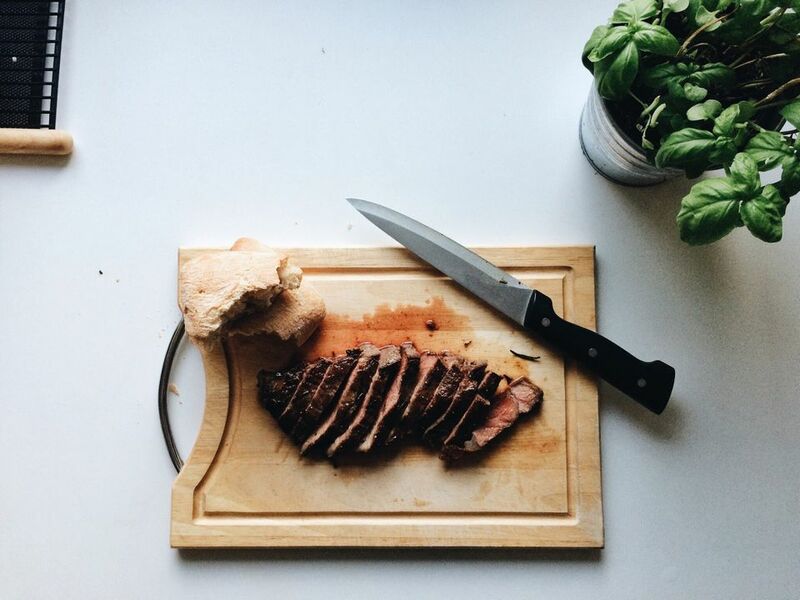 Resting helps preserve the steak's juices, so that they don't come gushing out when you cut into it. The resting times for each method are included in the instructions. And of course, remember to slice your steaks against the grain. While this is most critical with tougher steaks like flank steak or skirt steak, even a tender steak like a ribeye will be tougher if you slice it with the grain. If you're going to go to the trouble of cooking it properly, you might as well slice it properly, too. Searing means to apply very high heat to a piece of meat, for the purpose of browning it and producing a flavorful crust on the outside. Needless to say, you definitely want your steak to have a brown, flavorful crust, and searing it is the way to get it. One of the most traditional ways to cook a steak is using a combination of searing, in order to brown the steak, and indirect heat in the oven, to cook it to your desired doneness. It doesn't necessarily matter which order you do them in, but it's traditional to sear first and finish in the oven, and that's what this method does. Get your skillet hot, add some high-heat oil, such as refined grapeseed oil, and then set your steak in the skillet. Sear for two minutes, flip and sear for another two minutes, then transfer the entire skillet to a 350 F oven for 2 to 5 minutes. Then take it out, remove the steak from the skillet and let it rest, covered in foil, on a cutting board for 7 minutes. Overall, this steak looked and tasted pretty good. Total cooking time was 15 to 18 minutes, which puts it right in the middle of the pack. Pros: This is a traditional method that has been in widespread usage. If you've eaten a steak at a restaurant, it was almost certainly cooked this way. This method produces a hard-seared crust, which is precisely what you want from a perfectly cooked steak. Cons: In our test we observed a thin, gray ring around the edge, which indicates a slight amount of overcooking around the exterior. The cooking process leaves little room for error in terms of timing, which can lead to a sense of panic in the kitchen. In this method, we turn the tables on the previous method. This time we start the steak in the oven and then sear it afterwards. With the reverse sear, there's no particular hurry, no panic (unlike in the previous method), making this technique a fairly foolproof one. After seasoning, place the steak on a sheet pan with a rack and transfer it to a 200 F oven, where it will cook for 20 to 35 minutes. Your target temperature for the steak is 120 to 130 F, at which point it is considered rare. After coating the steak with oil, a quick sear in a hot pan (on both sides) will get it right to 135 F. Applying high heat at the end of the cooking means you'll need a longer resting time, but 10 minutes should be plenty. Pros: This steak exhibited less of the undesirable gray ring we saw in the previous method, with even cooking all the way through, and resulted in a perfect medium-rare with a lovely seared crust on the outside. The cooking process itself was considerably more relaxed. Cons: The flip side of a relaxed method is that it is the slowest method, with cooking times anywhere from 30 to 45 minutes. Even so, if a perfect steak is what you want, and you don't mind waiting, this might be the method for you. It's the simplest method, and by far the quickest, while most closely replicating a char-grilled steak cooked on an outdoor grill. The only caveat is that it works best with a boneless, rather than a bone-in, ribeye because the steak needs to be right up against the surface of the pan, and the rib bone can interfere with that. Pros: This method was easy to execute, quick (only 8 minutes combined cooking and resting time), and produced a steak that was cooked to medium to medium-rare perfection. If you enjoy a char-grilled steak, this is the technique for you. Cons: Obviously if you don't care for the char-grilled effect, you might prefer the next method. This steak also exhibited varying degrees of doneness at the edges (although this can be minimized by ensuring the steak is cut to uniform thickness). In addition to seasoning, with this method we also apply a generous knob of butter to the top of the steak before cooking it, on a sheet pan with a rack, in a 450 F oven, for 15 to 20 minutes, followed by a 5-to-10-minute rest. Pros: This method produced a steak with even doneness and a soft texture. The lesser degree of browning allowed the pure flavor of the aged beef to shine through. It did not display any telltale "ring" indicating overcooking. Cons: This method will not yield the fully seared crust produced by the techniques described above, so its texture will be somewhat one-dimensional. Moreover, its lesser degree of browning means that it will lack the complex flavors that the Maillard reaction creates and the meat had a tendency to curl in the oven. Its 30-minute total cooking time (cooking plus resting) is on the longer side as well.